The angle, a bit over 8 degrees (90-81.7=8.3) is the "kingpin inclination" (KPI) or "steering axis inclination" (SAI) angle. It is basically, the angle from vertical about which the knuckle rotates when steered. There are pros and cons to this angle being big or small. One pro, is it ends to reduce the "scrub radius" that some people say is a bad thing. It also provides a centering force akin to positive caster. A con though, is that it produces positive camber in the outside wheel - i.e., if you turn right, the left front wheel will get positive camber just from turning. The higher the KPI, the more positive goes the camber. This is a Bad Thing. Can't change KPI in this class, really requires a whole new knuckle. But we can fight this Bad Thing with a Good Thing, and in our case that Good Thing is positive caster. Caster is the same sort of angle as above, except as viewed from the side. Positive caster produces negative camber on the outside wheel when turned. The more positive the caster, the more negative camber gain. Autocross has some fairly tight maneuvers, ones that often require large amounts of steering angle input. Long wheelbase cars like the Camaro have to use even more steering input around given radius corners (see CVD 4 - Skidpad for some explanation), making it all the more important that, to the maximum extent of our rules-bound ability, we minimize any unfavorable consequences of turning the wheel. Many modern cars use a lot of caster. The Porsche 911 GT3 uses upwards of 8.5 degrees; some Mercedes-Benz come from the factory with over 11 degrees. Heck, even the latest Mustang uses 7 or more. Lots of sporty cars made in the last 20-30 years provide 5-7 degrees. That's right, the factory caster setting is positive 1/2 degree, plus-or-minus 1/2 degree. Meaning potentially zero degrees positive caster! So with over 8 degrees of KPI/SAI, there is almost no positive caster to counteract that positive camber gain on the outside front tire. So, to try to nullify this Bad Thing we'll add some positive caster to the equation. Common thinking amongst most of the first-gen Camaro guys is that "4 or 5 degrees is enough"...which of course means that I'll be aiming for at least twice that much! 🙂 The thing is, even at about 8.5 degrees of positive caster, its beneficial effects are only canceling out the detrimental effects from the KPI. A first-gen Camaro with 12 degrees of positive caster will only see about the same positive effect from caster, that a "normal" car would get with 6-7 degrees. Adding all this caster isn't a trivial endeavor either. There's a few side effects that must be managed. One is an increase in steering effort. I'm a big believer in providing the driver with a stable, precise, sensitive, and consistent platform upon which to operate. If we require the driver to use big muscles to dance the car through the course, we can't expect the driver to have a lot of precision touch in his inputs. To help enable this, I plan to run power steering. An excellent race seat will hold the driver in, without any stabilizing forces through the wheel. This should enable "fingertip" steering wheel forces, enabling the driver to maintain a much better feel for the front tires. I believe the power steering ratio on the Z28 was also a bit quicker, which I like - it's also harder to be precise when you have to produce huge turns of the wheel in a small amount of time. The other side effect is it can change your wheelbase. 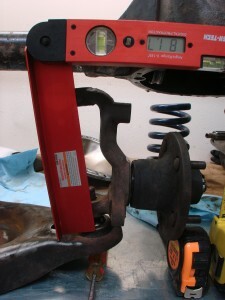 The traditional (and FSM-specified) way of adjusting camber and caster on these cars is to use shims on the upper control arm's inner attachment point. 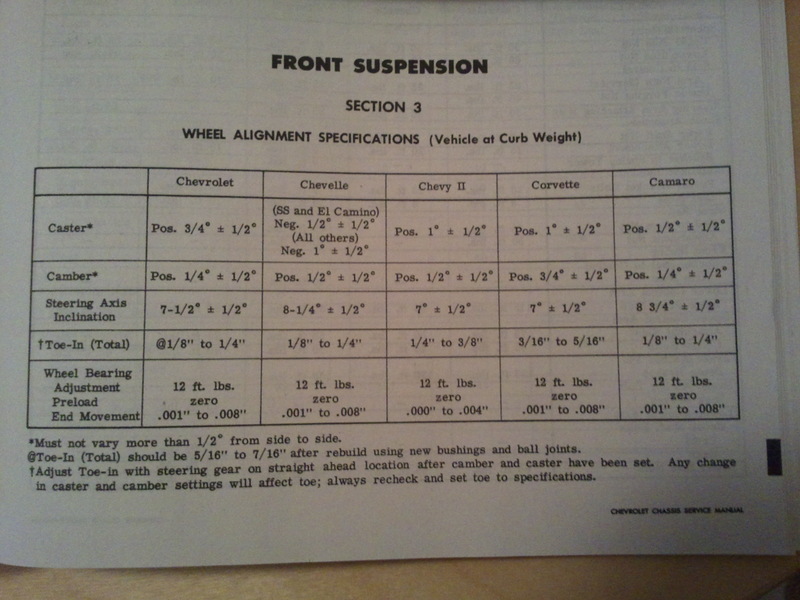 Use of shims at both ends produces negative camber, and their use at one end or the other changes caster. The threaded upper bolts are long enough to produce large amounts of change. 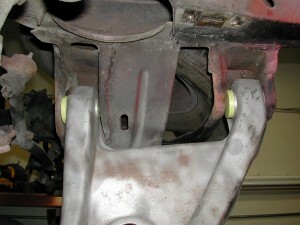 This method of caster adjustment moves the upper ball joint "back", and if the hub is centered between the upper and lower ball joints, moves the wheel centerline back half that distance. The problem here, is the whole wheel is moved back in the wheelwell, and with the amount of caster I plan to add, doing it all with the upper arm, would move the wheel back more than 1/2". I want to be able to run very very low, and do everything I can to reduce or eliminate rubbing with the big 265-section front tire. The Camaro's inner fender has the most vertical room right at the stock front wheel centerline, which means I need to keep the wheel centered to maximize how low I can go. To keep the wheel centered, but still produce large caster values, means I need to also move the lower ball joint forward, while moving the upper ball joint rearward. If I move each equal amounts, the wheel stays centered in the wheelwell, and I get to enjoy the yummy KPI-canceling positive caster. Since I'm spending my custom control arm allowance on replacement upper control arms, I have to stick with the stock lower arms. 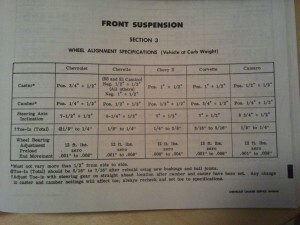 However, there is an allowance for replacement offset bushings. So long as these offset bushings don't contain any more metal than stock, I can use them to produce some of this same caster gain. You can see in the pic below, how the mount axis goes through the bushing cylinders at an angle - this produces a clockwise rotation (in top view) of the driver's side lower control arm, moving the lower ball joint forward. John is just about completed with these custom Hydlar lower control arm offset bushings for the Camaro. There's a good amount of "meat" to the stock bushings, allowing for a satisfying amount of longitudinal forward offset of the lower ball joint. It probably isn't enough to produce entirely half of the caster I'm after, but it'll be close, and should make a big difference in keeping the front wheels centered in the wheelwell. 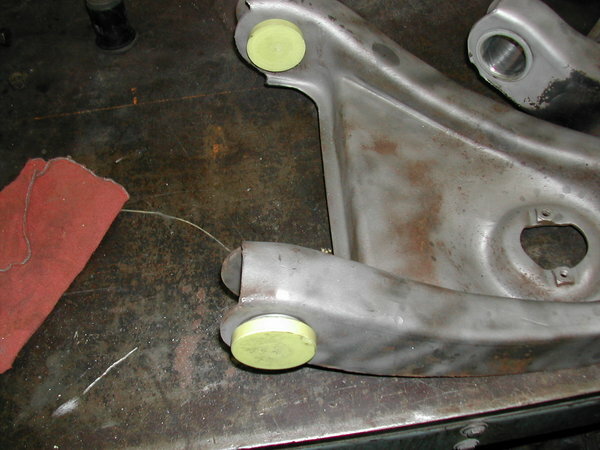 A lot of the first-gen guys add a bunch of positive caster to their cars all with the upper arm, and run into bad rubbing problems, because of this rearward movement. Anyway, these offset bushings are a relatively small detail. The thing many people overlook, is lots of small details start to add up. An ounce of weight savings here, a smidge of improved alignment there, maybe another 1/2 hp freed up, all make a difference. Those who remember their Calculus know, that even when you're dealing with really really tiny quantities, so long as you find enough of them to add up, you can eventually end up with a substantial (Riemann ;)) sum. This "sum of many tiny parts" thing was made most clear to me not in Calc class, but at the 2005 Solo National Championships, where I was codriving with Gary Thomason in his insane SM2 C5 Corvette. Anybody who knows Gary knows how meticulous he is in the care of his cars - not just their finish and appearance, but in their overall state of tune and function. Gary was constantly tweaking things with the car - 1/32" rear toe changes between runs, fraction of a PSI difference in the tires, etc. I'll never forget the morning of day 2, him looking to find a way to get the running lamps to stay off. The car's AFR-headed LS-based 408 was making 600+hp, but the real story was the insane low-end torque, combined with the stock short Z06 gearing. The thing would obliterate the tires with a hair's too much throttle. It took a perfect alignment of the planets before you'd even consider full throttle, and on most courses you never got there. Yet here we were, out on the beat up old airbase at Forbes Field, trying to get the running lamps to stay off, which would reduce the load on the alternator and free up some tiny bit of HP. We found a way to keep them off, and on his last run that day Gary blazed an unbelievably fast time to pull ahead of Andy McKee in his superior RX7, and take the championship. While obviously you need the Big Stuff like top driving skill and the right tires in place to be contending for a National Championship, I now know that what many perceived as alien ability, or good luck on an unusually fast run, was actually the synchronous coming together of an uncountable number of tiny, carefully orchestrated, details... including that 'Vette's last 1/3 of a horsepower.